Firstly, there really aren’t any ‘tricks’……but you do have to give a bit of strategic thought to what you’re doing and why. Whilst what I’m about to say might appear a bit sneaky or contrived, it’s not. 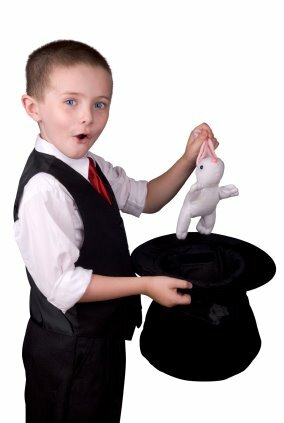 It’s just simple, solid actions to help get your message across as well as possible. 1. We had a newsworthy story – that’s the most important bit by far. Here’s the first sentence of our media release that went out – you can see we’ve told all the important information up front. 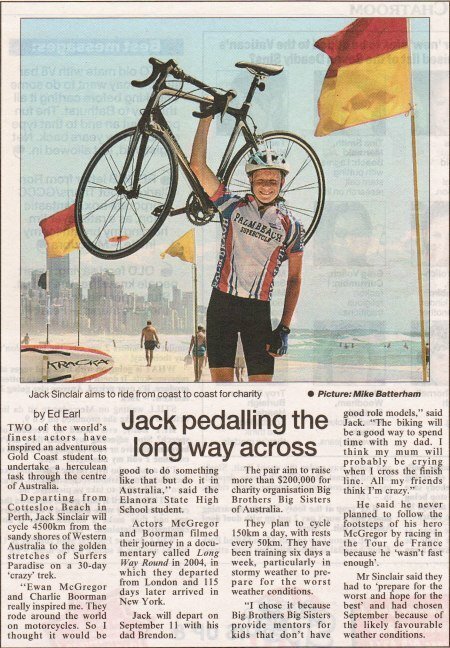 A 15 yo boy riding across Australia is newsworthy. So 15 yo Jack is our focus. A 41 yo bloke (me) riding across Australia is boring. So we don’t focus on me. 2. Our ‘conference’ was for 10am – the media want their stories nice and early. They’re busy people on tight deadlines so 10 am is a good time. Midday is too late. 3 pm is way, way too late. 3. Our ‘conference’ was on a Friday. The main reason for this is because the biggest readership of the local newspaper is on the Saturday, so we were hoping for that (we got Wednesday – which is the 2nd biggest readership day). 4. Our ‘conference’ was the presentation of a new bike (and we mentioned Jack would be there in his bike gear). 5. The presentation was made on the boardwalk in front of the Pacific Ocean. 6. The presentation location was central for the media with easy access and parking. 4, 5 and 6 are all very important – the TV crew and newspaper photographer both wanted great vision and presenting a new bike gives some good photo opportunities. We chose a boardwalk because I knew Jack could ride up and down it 100 times (like he did) with perfect access for the cameramen without the hassle of cars spoiling the shot. We chose the beach because it’s relevant in that Jack is riding from Coast to Coast. The location has the backdrop of the iconic buildings that represent the Gold Coast, as well as the ocean which could be used – the newspaper photographer used the one of Jack on the beach in front of the surf lifesaving flags (the absolute iconic Australian beach image) with the buildings in the background. 7. What Jack is wearing – our bike sponsor is the wonderful Roger at Palm Beach Supercycle. So Jack wears Roger’s jersey. His nicks (shorts) are plain (he has tons of branded with other people’s sponsor logo so he didn’t wear those). Tuff Gloves sponsor Jack with gloves – so he wears them the whole time. And he wears Tuff socks too – because they’re very comfortable and to support the glove sponsorship. As you can see from the newspaper story, the Tuff Gloves can’t really be seen too well – but at least we tried! Also, Roger from the bike shop came along to present the bike – he was also wearing Palm Beach Supercycle gear. I was kitted out in the gear of Hammer Nutrition – our nutrition sponsor. Roger was featured on the TV story, as was I a bit – so both brands got a run. 8. Jack’s helmet – Jack is wearing Roger’s helmet in the TV story and newspaper photo. It’s a MET helmet and, although we’re not sponsored by MET, we’re about to approach them. So we thought we’d do the nice thing and try and give them some value. When Jack and I are sitting down being interviewed for TV we wear our Perth to Paradise caps. All pretty simple stuff when you think about it. Basically what we’re trying to do is give the reporters what they want – an interesting story. If we can do that so it’s as easy as possible for them to get what they need (footage, backdrops, good quotes, etc) then all the better. The use of our sponsors gear wasn’t pushy or in your face – it’s just all just good gear is all. And it’s gear we’d normally wear whilst bike riding anyway. As you probably know, all bike riding gear is heavily plastered with logos anyway, so what we were wearing probably appeared a little underdressed! Brilliant stuff Brendan. Thank you for sharing how you did it and why. Really interesting.